There’s nothing glamorous about a wheel dresser, but if you own a tool with a grinding wheel, you need one. A wheel dresser removes the buildup of crud on the grinding surface, exposing new grains for better cutting performance. You can also use it to square the face of the wheel when it isn’t running true. Grizzly makes their version of this tool (pictured) heavy on purpose. 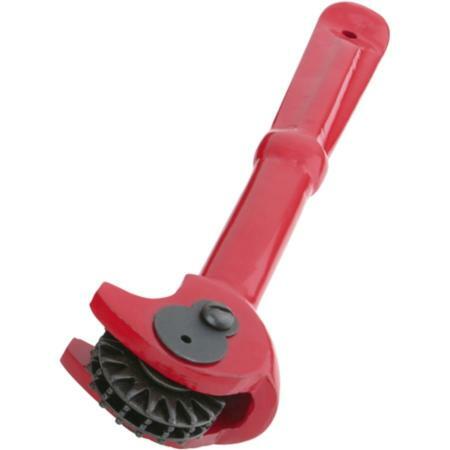 The cast iron handle offers more stabilizing mass for better control. This #0 wheel dresser from Grizzly can be found for as low as $8 — a lot cheaper than throwing away that errant wheel. And many other companies offer similar products for about the same price. Brace yourself for a dumb question. I have a grinding wheel and a wheel dresser, but I’m not so confident on its proper use. I tried it once but I don’t think I did it right. It made a lot of noise and not much difference to the grinding wheel. Do you hold the dressing wheel at an angle to the grinding wheel? Or should they run perfectly parallel to each other? How much pressure should you apply? Is it all a matter of developing a feel for the particular situation? John, it’s not a dumb question, I just went out to the garage to dress my grinding wheel because I didn’t remember how to either. Hold the dresser so that the two prongs rest on your tool rest. Then pivot the tool into the grinding wheel so the little wheels start turning. Move the tool back and forth across the face of the grinding wheel, keeping it perpendicular to the tool rest. Truing will probably take a little more work and a little finesse. I’d recommend using another tool if you use your grinder to sharpen anything finer than a law mower blade. Good article & Precise web site �. I am looking for the wheels for my wheel dresser. It is a Sears. The ID of the hole in the wheel is .270. The four wheels are .090 thick and two washers are .025 thick.